Torquay's Big Wave reminds me of riding the L train. I've been wanting to review this summer release from Soft Power Records for too long. It was something I played over and over and over again on my many trips to and from Union Square. And now, sitting on a suede couch in upstate New York (it's currently 39 degrees outside), I listen to their newest EP and feel dreamy and nostalgic. Starry-eyed for the most memorable parts of summertime: laying out in McCarren Park, wearing floral patterns, eating lunch by the Brooklyn Bridge, wandering city streets. 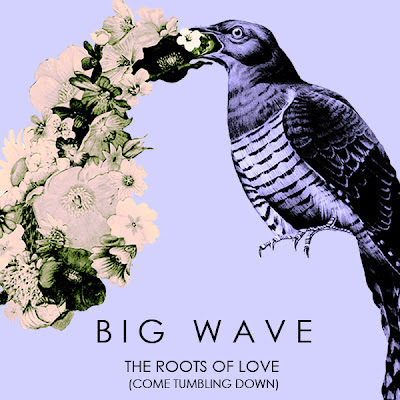 Big Wave's EP The Roots of Love (Come Tumbling Down) came out on June 11th. I know a few months ago we tweeted about how we thought "beach albums were so last year" but this might just be the exception to that rule. Deemed "beach pop," the songs on the EP have a lo-fi jangle and a fresh female vocalist that's reminiscent of warmer days. My first reaction to this was total eureka, something along the lines of "Who IS this?" and "Why haven't I heard of these guys before?" I can honestly say that each track on this cassette is unique (and especially well-crafted) so it's nearly impossible to pick a favorite. The EP opens with "Circumstance" which is seemingly a playground of pop hooks from start to finish. Just as much about the lyrics as its energetic instrumentation, "Circumstance" produces the gravity of unapologetic ocean waves with its upbeat guitars and twee coos. A dreamy highlight, "Another Year Or Two" (also on an earlier release) throws in a sweet and subtle synth that carries the song through. This track's lyrics "Now I see/You always leave me/For the girl with dreams" makes me feel weirdly warm and fuzzy. If you enjoyed this, they've got a new single "Dying on the Vine" which was recently put out by Art is Hard. For more check out Big Wave's bandcamp.